Peel the sweet potatoes, break into pieces and put to boil, when they are soft, then puree. Quickly add the soft butter and sugar, cinnamon , salt and warm milk, and mix well. Grease a rectangular mold and pour the puree spreading it evenly. Take it in preheated oven to 400 degrees F. and cook for about 20 minutes. 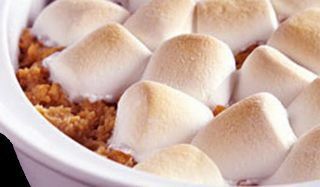 Add Marshmallow on top and take it back in the oven for about 10 minutes or until the Marshmallow are lightly browned.